Custom orders always accepted! I love making custom items of any kind. Message me to discuss your idea. Since all collars are handmade, measurements may vary slightly. If you have any concerns regarding size or fit of a specific collar, please message me and I can send you its exact measurements. Happy shopping! Feel free to message me with any questions - I am happy to answer them! It's awesome! Wade loves his new collar! Bow ties are coming soon! I've been working hard on a pattern, so you can have the fluffiest & flyest bow ties in town. My 9 year old husky mix, Sheba, wearing one of my first nylon collars. Artisan crafted accessories for you and your pets. Nerdy by Nature offers artisan crafted accessories featuring cute, and nerdy themed fabrics for people and their pets. All items are handmade here in Austin, Texas. What if the collar doesn't fit my pet? Since all collars are handmade, measurements may vary slightly. 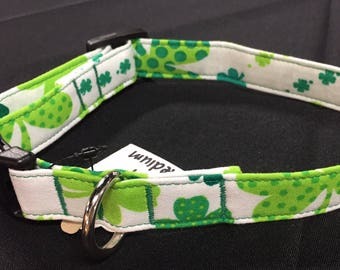 If you have any concerns regarding size or fit of a specific collar, please message me before ordering, and I can send you its exact measurements. If you order a collar and it doesn't fit your pet, please contact me and we can work out an exchange. What if there's a collar I like, but not in the size I need? Just ask! I have more of most of the fabrics and materials in the shop, and I'd be happy to make one in the size you need. Just send me your pet's measurements and I can recommend the best size. Hand or machine wash on gentle in cold water (a delicates bag is recommended to protect the hardware). Hang or lie flat to dry. These two methods have been tested on both our fabric and nylon collars. Machine wash on gentle in cold water. Why aren’t collars priced by size? You’ve probably often seen that in pet stores and while shopping online, collars are priced by size. I want to make sure that customers like you, pick the size collar that’s best for your dog, and not pick a collar based on price. All collars take about the same amount of time and care to create, whether it’s an XS or an XL. All dog collars are priced by style (buckle or martingale) and by material (nylon, fabric, metal buckle, etc.). If you have any additional questions, please contact me and I’ll be happy to answer them! If you can’t find the answer to any question you have, please feel free contact me and I’ll be happy to answer it! ★ Cat - Width: 3/8" - Adjustable Length: 7" - 10.5"
★ XS - Width: 5/8" - Adjustable Length: 9" - 13"
☆ S - Width: 3/4" - Adjustable Length: 10" - 14"
★ M - Width: 3/4" or 1" - Adjustable Length: 12" - 18"
☆ L - Width: 1" - Adjustable Length: 15" - 23"
★ XL - Width: 1" - Adjustable Length: 17" - 26"